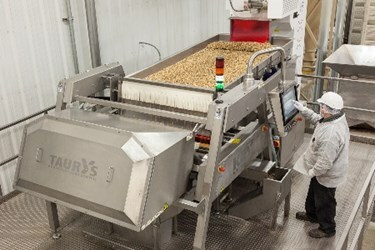 When Morada Nut Company was selecting the best equipment for their new state-of-the-art walnut shelling plant, they searched for a digital sorter that would help them produce the highest quality product on a consistent basis. They chose Key Technology’s powerful laser sorter, Taurys, to remove foreign material (FM) and defects from the product and color sort for grading. Taurys is Key’s newest high performance chute-fed laser sorter. It can be configured with a wide range of detection wavelengths to sort on the color and/or structural properties of a wide variety of nuts as well as dried fruit, frozen fruits and vegetables, fresh cut produce, confections, coffee, and snack foods. With its powerful sort engine, new architecture, new ejection manifold, and the most effective and reliable lasers, Taurys handles higher incoming defect loads, increases detection resolution, and improves the accuracy of defect and FM removal and color sorting. Taurys improves sorting efficiencies and reduces false rejects to help food processors improve product quality while maximizing yields. Featuring a 1200-mm (47-inch) wide inspection zone, Taurys sorts up to 4.5 metric tons (10,000 lbs.) of walnuts per hour. Taurys’ settings can be stored and retrieved for fast changeovers. The icon-based graphical user interface (GUI) is easy to learn and use, which reduces training and simplifies operations. The GUI can reside locally and can be accessed remotely via Taurys’ OPC-compliant infrastructure. This enhances flexibility in the operating environment and eases access for remote factory troubleshooting and application assistance. For more information, visit www.key.net/products/taurys. Key Technology, an ISO-9001 certified company, is a global leader in the design and manufacture of process automation systems including digital sorters, conveyors, and processing equipment. Applying processing knowledge and application expertise, Key helps customers in the food processing and other industries improve quality, increase yield, and reduce cost.With worldwide sales representation, the company maintains demonstration and testing facilities at its headquarters and manufacturing divisions in Walla Walla, Washington, USA; and at Key Technology in Beusichem, the Netherlands and Hasselt, Belgium. The company's common stock trades on the Global Market tier of The NASDAQ Stock Market under the symbol KTEC.